Marriages are always made in Heaven. 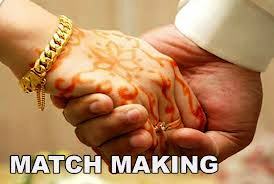 For prospective bride and groom Match-Making analysis covers love, mutual understanding, family happiness, children etc. This takes into consideration various areas of life and also covers Guna Milan, Mangal Dosha analysis, and the possible remedies for any weakness, which may persist. To find out how will be your married life, Our team of expert Astrologers will exactly guide you by giving possible favorable, unfavorable periods & corresponding remedies during hard time. Do You have any doubt related to Marriage, Please fill up the following form and then proceed.